2.3 Did You Steal This, Perhaps? A newcomer is trying to bring the reputation of two local alchemists into disrepute. Talk to Nevusa Lakasyn in her shop in Ranyon-ruhn. Search for evidence against Sinsal Nedriem with the help of Simeth. Confront Sinsal Nedriem with a strong poison. Accuse Sinsal of stealing some ebony from the mine. Accuse Sinsal of stealing some expensive wine. Force Sinsal Nedriem to leave town. The alchemist and healer of Ranyon-ruhn, Nevusa Lakasyn and Irele Nathryon, are confronted with a new potion seller in town, Sinsal Nedriem, and they don't like it one bit. The problem is that he is spreading lies across town of the quality of their potions. The quest can be started by talking to Nevusa Lakasyn, although you may want to skip this conversation and talk straight away to Irele Nathryon, who asks you to accuse Sinsal Nedriem of spreading lies. Walk over to The Dancing Jug in Ranyon-ruhn, and accuse Sinsal Nedriem of lying. This won't work however, no matter how high your disposition with Sinsal is, because there is no solid evidence of the slander. This could lead to a dead end, were it not that the guard captain of Ranyon-ruhn, Simeth, also wants to get rid of Sinsal. He can be found on top of the guard tower in the middle of Ranyon-ruhn. He asks you to complete the quest Romance in Ranyon-ruhn first before he helps you. The first plan he suggests is getting a poison from Irele Nathryon and accusing Sinsal Nedriem that he attempted to poison Master Mithras with it. Sinsal Nedriem simply breaks the bottle in front of you and declares that he has nothing to do with the non-existing plot. Did You Steal This, Perhaps? Simeth's second plan is to accuse Sinsal Nedriem of stealing some ebony from the mine. Go see Mirisun Varen in the mine office to borrow a piece of ebony ore a bring it before Sinsal Nedriem to accuse him of the theft of the piece. Sinsal claims that if someone is a thief of ebony, it is you, and he isn't impressed by your attempt.You should now return the ebony to Mirisun Varen. The third plan is to get some Skingrad Wine from Nevusa Lakasyn and accuse Sinsal of the theft of the bottle. Strangely enough, this works, and Sinsal offers you 500 septims to conceal the theft from the rest of Ranyon-ruhn. 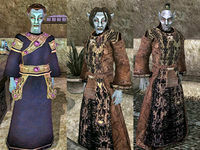 You can take the 500 septims, but then Nevusa, Irele and Simeth will be annoyed and their disposition will drop. You can refuse the bribe, in which case Irele Nathryon will reward you with some potions because Sinsal Nedriem will leave town. In this case, you also get a point of Reputation. You can also try to get 1000 septims from him, but this will require a high speechcraft. If you push him too hard to get the 1000 septims, he will attack you and you will be forced to kill him. In this way you will forfeit your reward, so it is risky to attempt to get the 1000 septims from him. 5 Nevusa Lakasyn, the healer of Ranyon-ruhn, told me about a Dunmer who has been damaging her business lately. Nevusa herself is rather afraid of taking drastic measures against the slanderer and suggested that I speak with Irele Nathryon, the local alchemist. 10 Irele Nathryon seems to be furious because of the slander that Sinsal Nedriem has been spreading about her and Nevusa Lakasyn. Unlike Nevusa, Irele is determined to stop this and has asked for my assistance. 20 I decided to help in stopping Sinsal Nedriem. According to what Irele Nathryon has told me, this elf has lots of nerve and won't stop unless we get him really spooked. I'd better pay him a visit. 30 Sinsal denied the accusations. He insists that all he does is offer quality services. I will have to ask around if I'm to discover any hard evidence and use them to confront him. Perhaps the guards can be of some assistance. 35 I talked to Simeth, a guard here in Ranyon-ruhn. He is aware of the situation but has his hands tied, due to the lack of evidence. He promised to help me if I, in return, help him with an affair of his. 40 Simeth, the guard, is well-aware of the situation. His hands are tied however, due to the lack of evidence. However, he has a plan, but one which he cannot execute given his position. I am to ask Irele Nathryon for a strong poison and must accuse Sinsal of intending to use it against Master Mithras. 45 Irele Nathryon gave me the poison. Time to confront Sinsal. 50 I accused Sinsal Nedriem but he just won't bite. He took the poison vial and broke it in front of everyone while declaring his noble intentions. I'll have to bring Simeth the news and figure out something else. 55 Simeth came up with a new plan. I'll ask Mirisun Varen, the guard down in the mine, to give me some ebony. I will then accuse Sinsal Nedriem of being a thief. 60 Mirisun Varen handed me a piece of ebony and told me I have to return it after the job is done. 65 I accused Sinsal of stealing the ebony to make potions. Once more, he had an alibi. I must return the ebony to Mirisun and tell Simeth of our new defeat. 70 I gave the ebony back to Mirisun Varen. 75 Simeth has one last plan. He wants me to get a bottle of Skingrad Wine from Nevusa Lakasyn and accuse Sinsal Nedriem that he stole it. Why do I even bother trying? 78 Nevusa Lakasyn gave me the bottle of Skingrad wine. 80 I confronted Sinsal Nedriem once more. To my surprise, this accusation did scare him! 85 Sinsal attempted to offer me gold so that I allow him to continue his dirty work. Obviously, conscience is beyond this mer's comprehension. After I refused, he promised to leave Ranyon-ruhn and never return. I should tell Irele Nathryon the good news right away. 90 Finishes quest Irele was more than happy to be rid of Sinsal. She thanked me from the depths of her heart and gave me some potions which will certainly be of use if I find myself cornered. 100 Finishes quest Sinsal offered me gold in exchange for my... discretion. Simeth and the town's potion sellers won't be too pleased, but I seriously doubt they could compensate me in a better way for all the trouble I went through. 110 Finishes quest I killed Sinsal Nedriem. 120 Finishes quest Irele was disappointed that I had resorted to violence to end Sinsal's slander. This page was last modified on 6 March 2019, at 07:23.